Rotork IQ actuators installed on MMLP tank farm at the Port of Corpus Christi, Texas. processing, manufacturing, marketing and distribution and marine transportation services for petroleum products and by-products. 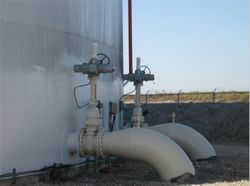 In 2011, an operating division of MMLP began building a single product tank farm at the Port of Corpus Christi, Texas, consisting of six 100,000 barrel tanks and four booster pumps to serve nearby truck and ship loading terminals. Originally, the facility was designed for a single hydrocarbon product. The terminal's original specifications did not require any automated valves to isolate the individual storage tanks. During construction, MMLP decided to upgrade and introduce the capability to handle a second product. This necessitated the requirement of isolating the tanks to avoid cross-contamination. To achieve this, MMLP chose Rotork's electric valve actuation system under centralised control. The Rotork system incorporates all appropriate interlocks which safeguard the integrity of the terminal operations. Rotork's local distributor, valve automation specialist DMC-Carter Chambers, working with engineering technical services company Testengeer, successfully promoted the adoption of explosion proof Rotork IQ non-intrusive intelligent electric valve actuators for this application. Monitoring and control would be facilitated by a Rotork Pakscan P3 digital system, designed specifically for valve actuation duties and the environments associated with hazardous area petrochemical plants and storage areas. Now in its third generation, Rotork Pakscan has been widely adopted in many worldwide industries, where the use of a fully redundant two-wire bus loop linking multiple numbers of actuators over long distances is recognised as delivering reliable monitoring and control with dramatically reduced installation and cabling costs in comparison with traditional hard wiring. Chris Duke, Rotork's lead service technician on the project, explains: "The customer didn't want to add a lot of new conduit and wiring to control the actuators, so the wireless Pakscan system was a perfect fit." First introduced in 2009, the Rotork Pakscan P3 wireless network control system is a further development of the Pakscan system used in thousands of plants throughout the world today. Simply stated, the system establishes a secure wireless mesh network that is used to control actuators and other field devices throughout the plant and to gather important operating data for asset management and preventative maintenance from the connected valve actuators. A Pakscan P3 master station fitted with a wireless interface module, which is typically connected to the plant's control system using industry-standard Modbus protocol over either a serial or Ethernet connection. A Pakscan P3 wireless coordinator module, which can be mounted, either indoors or outdoors, up to 200 metres away from the P3 master station (further if standard fibre optic converters are employed) and which functions as the base station for the system's robust mesh network. A wireless actuator module installed on each actuator on the wireless network. The wireless system operates on the license-free, globally recognized 2.4GHz ISM (Industrial Scientific and Medical) frequency band and has a line-of-site operating range between each device of approximately 30 metres indoors and 100 metres outdoors. Up to 60 actuators can mesh with a wireless coordinator. In a Pakscan wireless mesh network, each actuator on the network can act as an independent router to help signals get to their intended destination. A correctly designed network will be configured to provide two or more paths between each actuator and the wireless coordinator. Therefore, if the normal traffic route is blocked or if a hardware or communication failure should occur, it can be overcome as the network dynamically determines an alternate route for the data to travel. This self-healing network mimics the loop-back capabilities of the established Pakscan two-wire loop. In such a network, privacy and security are high priorities. To prevent unauthorised commands being sent to devices over the wireless network, all control data is encrypted using the Advanced Encryption Standard (AES). Additional encryption is incorporated into the system to prevent unauthorised devices joining the network and to prevent a message replay attack. The Pakscan P3 wireless network card gives the user access to all the standard control and monitoring features and data available from the wired Pakscan system, together with the diagnostic and asset management information stored as standard by Rotork IQ actuator data logger and configuration files, which is otherwise only downloadable locally, using the IQ hand held commissioning and communication tools. Using built-in web pages it allows easy extraction of these files from the control room over the wireless network. The installation at Martin Resources consisted of 16 Rotork IQ40 non-intrusive intelligent actuators, one Pakscan P3 wireless master station and three network repeaters, which are used to overcome radio black spots and ensure the redundancy of the network. "The installation of the actuators went pretty much to plan and, as far as start-ups go, this was by far the easiest of any type of control system that I have seen. "Some pre-commissioning of the wireless system was performed at the Rotork factory in Rochester prior to delivery and, once in the field I installed the wireless antennas on each actuator and gave each unit its unique address. When this was done I powered up the master station and, as if by magic, all sixteen actuators populated the network within a few minutes. "The customer was very impressed with the job done and how quickly everything came together." Following the success of this project, the same actuation and control system will be extended to three additional tanks to be built during the second phase of construction at this facility.